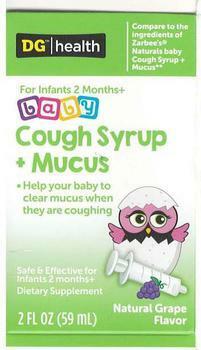 Kingston Pharma of Massena, N.Y., is recalling one lot of DG/health NATURALS baby Cough Syrup + Mucus. The product may be contaminated with Bacillus cereus/ Bacillus circulans, which can produce two forms of gastrointestinal illness. The recalled product comes in a carton labeled DG/health baby Cough Syrup + Mucus in 2-fluid oz., bottles marked with Lot KL180157 Expiration date 11/20 on the bottom of the carton and back of the bottle label; UPC Code 8 54954 00250 0. It was sold in Dollar General retail stores nationwide. Customers who purchased the recalled product may return them to the place of purchase for a full refund. Consumers with questions may contact the company at (844) 724-7347 8:30 a.m. – 6:00 p.m. (EST) or by e-mail at Christina.Condon@SciRegs.com.